The Disney resort we stayed at had a campfire on the beach for the kids every night, complete with marshmallow toasting kits (a super long dowel and a bag of six marshmallows plus verbal instructions on fire safety and what to do if your marshmallow caught on fire). It was nice to kick off our shoes, put our feet in the soft, white sand and relax while Alexa got to toasting her marshmallows. Thankfully she was kind enough to share. :) As you can see from the photos, this kid is serious about relishing her treat (and getting messy too). LOL! There's something to be said for roasting marshmellows!!!! I typically do it in the kitchen with a lighter! HA!!! 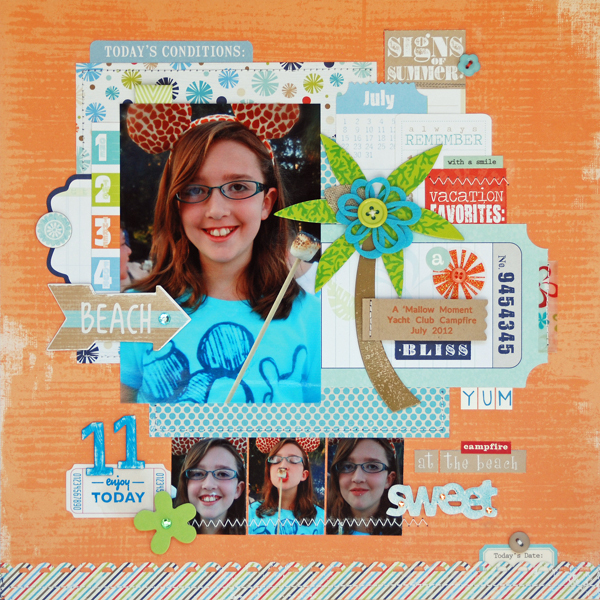 Super cute layout today!!! Really cute layout~love the topic chosen, don't to many LO's on this. Always Great!!! Ah u were right here in my backyard.luv the lo. Very colorful page! I liked all the bits and pieces you added. I loveeeeeeeee this!! LOVING the orange background, the photos and love love love that tree!!! Everything about this page is as sweet as can be! Love all the cute pics and the fun title: a mallow moment. Hee! You always have the best little touches. Terrific layout, Lisa. Awesome page. Totally adorable and fun. And marshmellows. yum! Very cute-I love the palm tree element! Lovely page! the palm tree is wonderful! love this page... All the layers and the little photos I love... Thanks for sharing. oh, Lisa...everything you do is so cute! This is just darling! I need some of those papers! CUTE! Such an amazing layout, and I love the mickey ears! She's too cute! so cute! love that orange! Love the large photo front and center Lisa! Great layout! I love this page! All the colors but especially the layering. Great pics. to be at the web the easiest factor to understand of. It's an amazing piece of writing designed for all the online people; they will take benefit from it I am sure.